Sad news continues to stream out of the Midwest as severe storms destroy homes and claim lives. My heart goes out to all of those affected, including those in Moore, OK. We’ll take some closer looks at severe storms and tornadoes as the spring and summer progress, but today I wanted to bring attention to a weather event you probably didn’t hear about. On May 4th tropical-storm strength winds blew through the Chivela Pass in Mexico. This in itself may not seem too interesting but did you known there wasn’t any kind of tropical storm in the area? The winds were due to a Tehuantepecer, or Tehuano Wind, a local wind created by the region’s topography. The Tehuano Wind. 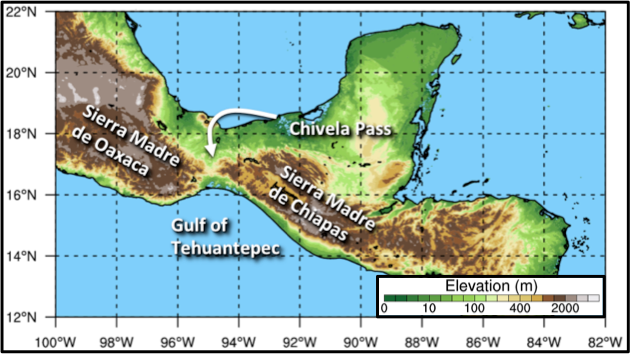 The orange shaded region in the southern portion of the image is the region of 30-knot winds created by the Tehuantepecer. The Chivela Pass is a gap in the Sierra Madre Mountains on the isthmus of Tehuantepec in Mexico. Pressure differences between the air masses north (Gulf of Mexico) and south (Pacific Ocean) cause air to stream through the pass. The more significant the pressure difference, the stronger the winds. Because the air masses are so large and the pass is so small these winds can reach tropical storm or even hurricane force. So what causes these pressure differences? The surface map from May 3rd: Notice over Texas and southward over the Gulf of Mexico. Colder air is streaming clockwise around that area of high pressure and south over the Gulf. This is the air mass that would blow through the Chivela Pass the next day. While the Tehuano wind is destructive, it also serves an important role to the local ecosystem. The strong winds churns the water in the Gulf of Tehuantepec and stimulates algal blooms, fueling an entire food chain! To learn more check out this article by NASA’s Earth Observatory. Don’t worry, a run-down of the predictions for this years’s hurricane season is still coming. The season begins June 1st. ← Wildcard Weather is back!